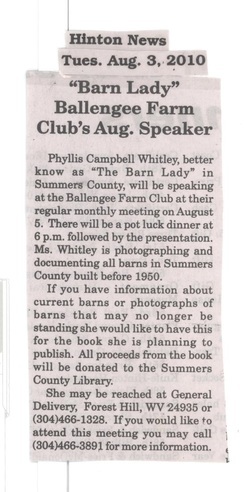 Beginning December 13, 2016 Mrs. Whitley began a weekly publication in the Hinton News featuring excerpts from her book, sharing barns and stories highlighting a different barn each week. Response from the public has been good and sale of the books at the library are good. The Hinton News does not have a web site. For copies of individual issues you must contact the newspaper. Following are some of the press releases. Please click on individual items if you want to read the article in larger type. Area newspapers have been very supportive of this project. http://www.register-herald.com/features/x2053733535/Bonjour-Barnes-of-Summers-County Story was released to the Associated Press and a number of newspaper picked up the story and printed various versions. It was first a whim. It soon became a passion. It ultimately evolved into three of the most rewarding years in my life’s journey. When I learned that my grandfather's barn would be torn down, I was filled with sadness. The old chestnut barn, no longer in use, was about to fall down. The sadness was for my failure to photograph that vernacular structure during years it stood at its best, during my summer visits as a young person on his farm in a small county in Southern West Virginia. I took photographs when I visited there in 2007. That was all that was on my mind. The course I ultimately took was nothing like my thoughts that day. I am an amateur photographer with a few awards for work in that venue; much of my business career involved technical writing (some published in technical journals); I never dreamed of publishing a book. The idea to photograph the barns began the fall of 2008. I took a few photos with my cousin, Joyce Waltman, showing me around. At an early visit with Christine Lowry she told me how her barn was once on another ridge and how her husband's great-grandfather moved it to its present location. He used a keel to mark each board before he dismantled it and moved it to the present location. Mrs. Lowery, 90 years young at that time lamented that she would love to restore the barn but just wasn’t up to it. Three years later she is as active as ever but is leaving restoration to others. I had thought, a “picture book to share with others" would be nice, but Mrs. Lowry changed that. I was hooked! It was a whim that soon became a passion. Over the winter I defined what I wanted to accomplish: a book about barns built in the county before 1950, to chronicle stories about the barns, the people and life in one small county in southern West Virginia. and to publish a book “Barns of Summers County, West Virginia Heritage”. The photographs are important but the people and their stories behind the buildings was something that begged to be told. I estimated I would find 75-100 barns. My husband, A.C. , saw that I needed a jeep if I planned to travel every road in the county, all 657 miles. Was he ever right! Many roads were narrow, steep with over 200 miles not maintained . He drove much of the time and, oh what a great time we had. The people were fantastic and shared many stories. Over the course of the next 2 1/2 years we traveled every road in the county, found over 250 barns built before 1950 and decided that I must stop or a book will never materialize. I didn't get them all, but I do not think I missed many. Chuck Grey at CRRL showed me that even I can create a web site. I was getting the word out. Newspapers and magazines began publicizing the project. Wayne Dementi of Dementi Milestones Publishing, Inc. in Richmond. agreed to publish the book. My lucky Day! Mr. Dementi was quick to understand the vision I had for the book, and my determination that it be printed in the USA. Now my passion has become a reality The book was published in November. It is more beautiful than I ever imagined. As Mr. Dementi said at a book signing at CRRL in early December, "It is a book for the ages, a record of the heritage of a part of our great country; something for future generations. It is a beautiful book. If you love old barns, history and/or West Virginia you will love and treasure this book." 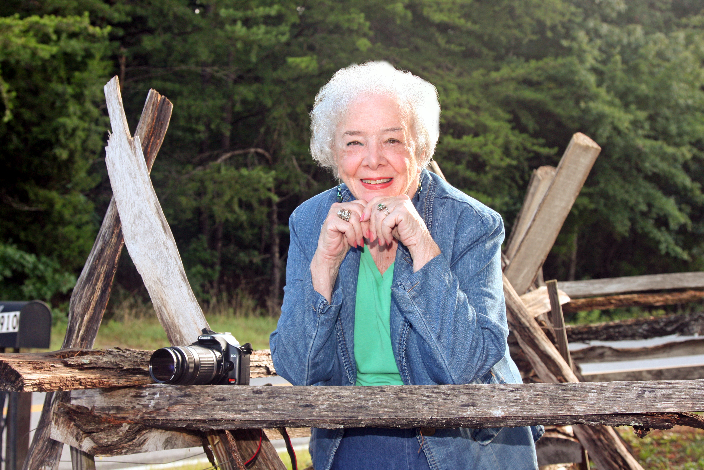 Phyllis Campbell Whitley will return to her native West Virginia for the inaugural signing of her history-laden book, “BARNS of Summers County ... West Virginia Heritage,” from 4 to 7 p.m. Tuesday at the historic Ritz Theatre in Hinton. The book signing session will include a big-screen show featuring each of the barns in the newly released book. Refreshments will be served by the Friends of the Summers County Public Library. The local library will host a book signing by Whitley from 10 a.m. to 2 p.m. Wednesday. All proceeds from the sale of “BARNS of Summers County ... West Virginia Heritage” will go to the Summers County Public Library. “It’s like a little written history of Summers County,” said Myra Ziegler, longtime director of the Summers County Public Library. 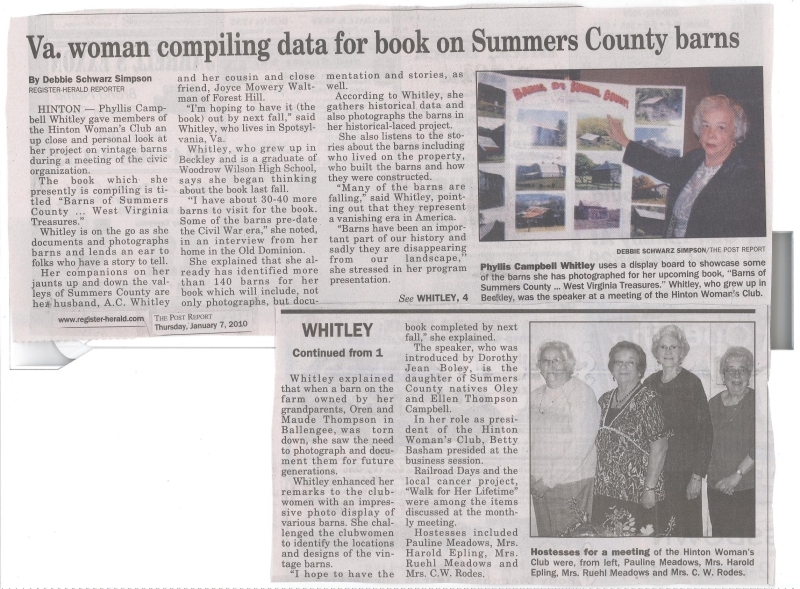 “She traveled every road in Summers County,” added Ziegler, pointing out that Whitley wrote not only about the farms, but also about the families who lived in them. Known as “The Barn Lady,” Whitley grew up in Beckley but spent her childhood summers on farms in Summers County owned by her grandparents. According to the author, it took almost four years to complete the history-laced hardback book, which has 240 pages filled with full-color photographs and stories of an era quickly fading from the American landscape. “My passion has been to chronicle the heritage, the culture and, more importantly, the people who created the barns and to preserve these treasures for future generations,” Whitley said.A 2012 calendar with 13 color photographs of barns showcased in the book also is available. Whitley, a photographer and artist as well as an author, and her husband, A.C., both are retired and reside in Spotsylvania, Va. When they come back to West Virginia, they make their home in their cottage on the Greenbrier River in Summers County. For more information on “BARNS of Summers County ... West Virginia Heritage,” visit www.barnsofsummerscounty.com. If you will click on "print this" you can read entire article with all photos - do not have to print unless you want. Wonder if the shoe store will be a sponsor - great shot of the boots! It was sooooo cold that day. 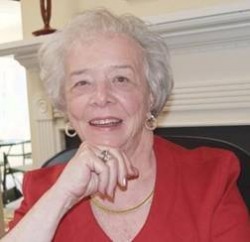 Phyllis Campbell Whitley will be a guest speaker at three meetings this coming week. She encourages everyone in the county with a barn built before 1950 to contact her. You can reach at her e-mail address acpcw@infionline.net or at her home in Barger Springs (304-466-1328) or General Delivery, Forest Hill WV 24935. If you want to know something about Summers County at the turn of the 20th Century, particularly of the Little Wolf Creek/Buck areas, then Glenna Saunders is a primary source. She and her late husband, Orville, lived in that area for many years. 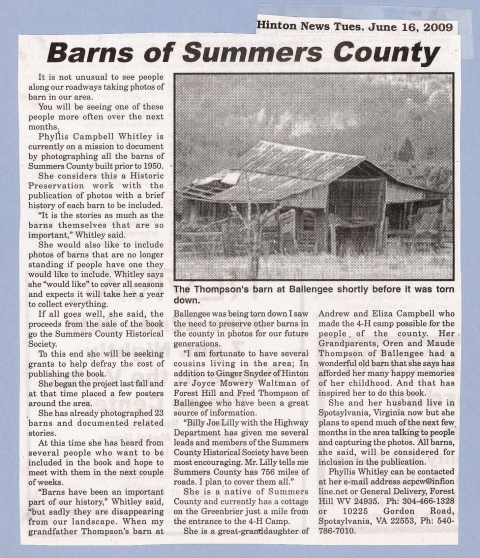 She had read about the “BARNS OF SUMMERS COUNTY…West Virginia Treasures” project and the work Phyllis Campbell Whitley was doing to preserve the history of the barns in our county. She invited Mrs. Whitley and Mrs. Joyce Waltman of Forest Hill to visit with her at her home in Beckley and share information and photographs. Many people in the Little wolf Creek/Buck area had mentioned that Mrs. Saunders had a wealth of information that would be of significance to the book. Mrs. Saunders’ keen memory provided many stories of life in the county in the early 1900’s. Many of her stories were backed up with photographs that she has saved over the years. Most of the photographs were taken by Mr. Saunders’ uncle, John C. Wikel, and are an extraordinary collection of the lives and times of many Summers County families. The Charles Woodrum barn, built in 1902, burned in 1958 but she provided a photograph for the section of the book that will include barns no longer in existence. It was possibly the largest barn ever built in the county. Other photos are of people building the stone foundation for a barn which exists today on the farm of John and Pat Distefano; a sawmill that provided lumber for many barns; and a panoramic photo of several farms as they were in the early 1900s provided a view of what the area looked like when it was primarily cleared for farming. With boxes of photographs at her disposal, she also shared stories of individuals and families who lived in the area. Mrs. Saunders graciously allowed some of the photographs to be copied for the book. The day long visit was an overwhelming success. Mrs. Whitley reports that the winter weather has slowed the photographing of barns in the county a bit but she is using this time to gather additional information about the 100+ barns she has already photographed. She has an additional 50 barns, built before 1950, identified to include in the book. She also welcomes anyone who has not contacted her about their barn to do so now.